The Bill for the Commercial Government Business Enterprises Act No. of 2018 has been temporarily shelved by Parliament. This came after much debate from both sides of the House. A set of criteria have been established to guide an Ad-hoc Committee in its deliberations to complete the work before the Bill is reintroduced in August 2018 Parliamentary Session. The Speaker will appoint members of the ad-hoc committee under Standing Order 48 (2). It’s one of the rare times when Members of Parliament (MPs) from both sides of the House, frankly and without reservations, spill out their views on government State Enterprises, when Parliament met yesterday morning to continue debate on the Bill for the Commercial Government Business Enterprise Act No. of 2018., introduced by the Minister for Finance and Economic Management. Just before morning tea break, the Prime Minister Charlot Salwai, requested the Speaker to adjourn Parliament for a short while as the Bill for the Commercial Government Business Enterprise Act No. 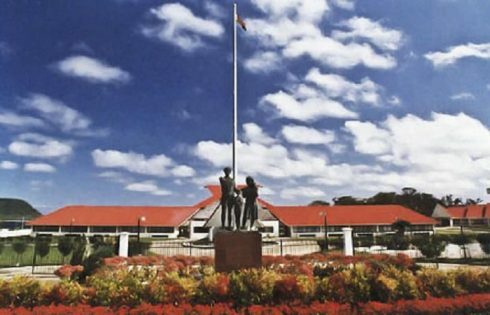 of 2018, came under heavy parliamentary attack with comments and remarks, for and against the Bill by both sides of the House and making mentions of problems and alleged issues faced by government Enterprises such as, Air Vanuatu, Airports Vanuatu Limited (AVL), the Vanuatu Broadcasting and Television Corporation(VBTC), the former National Housing Corporation, the Vanuatu Commodities Marketing Board (VCMB), the Vanuatu Agriculture Bank. Even government State Ministers highlighted problem issues in these government enterprises, stating that the problems faced by these enterprises have been long overdue and it is high time to put a full stop to such problems. State Minister for Foreign Affairs Ralph Regenvanu, said he supports the Bill and the purpose of the Bill which will serve to bring to an end of so much problems that inhibits such government enterprises. Minister Regenvanu repeatedly stated that these government enterprises have serious problems for years and the Bill before Parliament will provide solutions in curbing the problems faced by these government enterprises. Other MPs supported Minister Regenvanu. Other MPs were also critical of the government enterprises and labelled some of them as seen to be owned by those running the enterprises and or allegedly making money towards personal gains to build houses and private businesses. They claim that that these government enterprises never raise enough revenue to support government development initiatives but instead become liability to the government and always expecting to receive more grants from the government during budget sessions. The State Minister for Education MP Jean Pierre Nirua, in his remarks said he could stop certain scholarships and said many students graduate and return home but could not have access to Agriculture Bank, is one example he gave. He said he supported the Bill because the longer it is delayed to be passed by Parliament, the more these government enterprises eat into government budgets without making revenue to support government development initiatives. He also stressed the importance of proper and professional business management required to run the enterprises profitably and said all these government enterprises need serious review and their status. Just before Parliament recess for morning tea break, the Leader of the Opposition, MP Ishmael Kalsakau, proposed to the government that it will support the Bill, if the government withdraws the Bill, allow it to be thoroughly reviewed and reintroduced to Parliament to be passed. Many MPs who spoke either for or against the Bill, all expressed concern of political interferences in the running and the affairs of all the government enterprises over the past years. One MP said all past and present MPs have themselves to be blamed because all MPs and other politicians are “politics” themselves while other MPs level the blames for problems in the government enterprises on political interference and bad management as well as having too many board members on the Government Commercial and Business Enterprises. One MP alleged that some Chief Executive Officers(CEOs) receive Vt500,000, Vt600,000 and even alleged that a CEO receives Vt800,000 in salaries and wages. The MP made the comments before the Parliament voted unanimously to defer the Bill and to appoint an ad-hoc committee to review the Bill, taking into account all comments, questions, remarks made by MPs from both sides of the House.